Aluminium giant Alcoa has announced that it will invest $60 million on a manufacturing centre dedicated to advanced 3D printing techniques and materials. The facility is currently being constructed in Pittsburgh and will be part of Alcoa’s current research and development centre. The move is part of the company’s strategy of investing in more advanced aerospace and automotive products as it sells off its more traditional, but more costly smelting facilities. 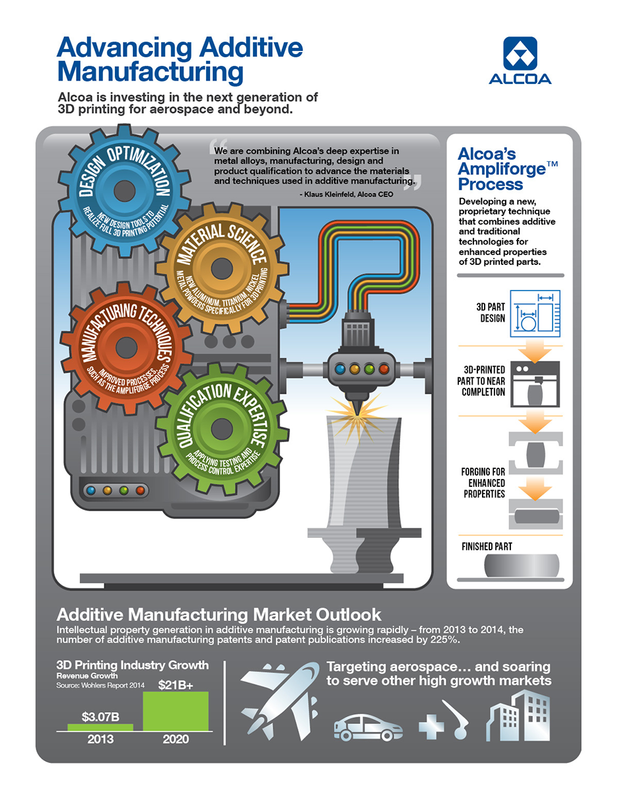 Alcoa has been creating 3D printed tools, moulds and prototypes for the past 20 years. The new facility will be completed by the first quarter of 2016 and is expected to generate over 100 new full-time jobs, which will include design experts, inspection and process specialists, and materials specialists. 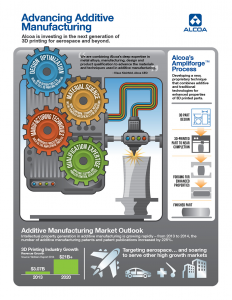 “Alcoa is investing in the next generation of 3D printing for aerospace and beyond,” said Alcoa Chairman and Chief Executive Officer Klaus Kleinfeld. The company also unveiled its Apmliforge process – a new manufacturing process that combines traditional manufacturing techniques with advanced materials and 3D printing, enhancing the properties of objects which otherwise would have been manufactured using traditional means. “Using the Ampliforge™ process, Alcoa designs and 3D prints a near complete part, then treats it using a traditional manufacturing process, such as forging. The Company has shown that the process can enhance the properties of 3D-printed parts, such as increasing toughness and strength, versus parts made solely by additive manufacturing. Further, the Ampliforge™ process significantly reduces material input and simplifies production relative to traditional forging processes. Alcoa is piloting the technique in Pittsburgh and Cleveland,” the company said in a news release.